Hi Everyone! We hope you had a few days of relaxation over the long weekend (or week for some of you!) Marjorie went to visit her daughter in Israel, and Kristine went to visit her sister in California. Now we are back from our far flung (ish) adventures and ready to talk charts! Kristine has had chart puns rolling in her head for days: unCHARTered waters, Top o’ the CHARTS, Conversation CHARTS (a play on conversation hearts- for a Valentine’s themed post) CHARTlize Theron (she also understands that many of these are going nowhere), and Ready, Set, CHART! (As an aside, we would welcome your chart puns in the comments!) Sadly, none of them quite match the idea of today’s post, co-creating charts with children. In our book, Smarter Charts, we talk about the challenges of creating charts with children. We want them to look good and be clear so that children will use them again. We also want children to be off the rug as soon as possible. Now that Kristine is with 4 and 5 year olds all day, the question that haunts her every day is, “How can I make sure this is as powerful as possible in the least amount of time?” Small children + Extended time on the rug as one searches for the red marker = Nightmares beyond what was ever imagined. This is where some of the advice we give in our book comes in handy: act like the chef in a cooking show. We have all seen cooking shows, Kristine herself is obsessed with the Barefoot Contessa (that house! that kitchen! her own boat?! ), and one of the advantages to being a chef on a cooking show is that most of the prep is done for you, ahead of time. The Barefoot Contessa is not chopping every item in front of you, she only shows what she needs to show, and the rest is prepped off to the side for her to use when she needs it. That is the key to quick and clear charting: know what to create in the moment, and what to prep ahead of time. 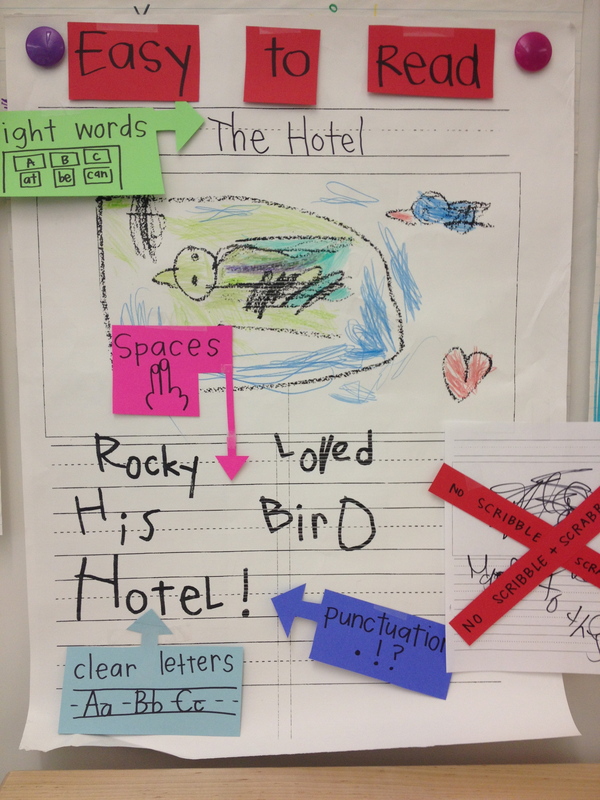 The following two writing charts were created by Kristine (The Barefoot Chartessa? You decide) with her kindergarten class using this method. 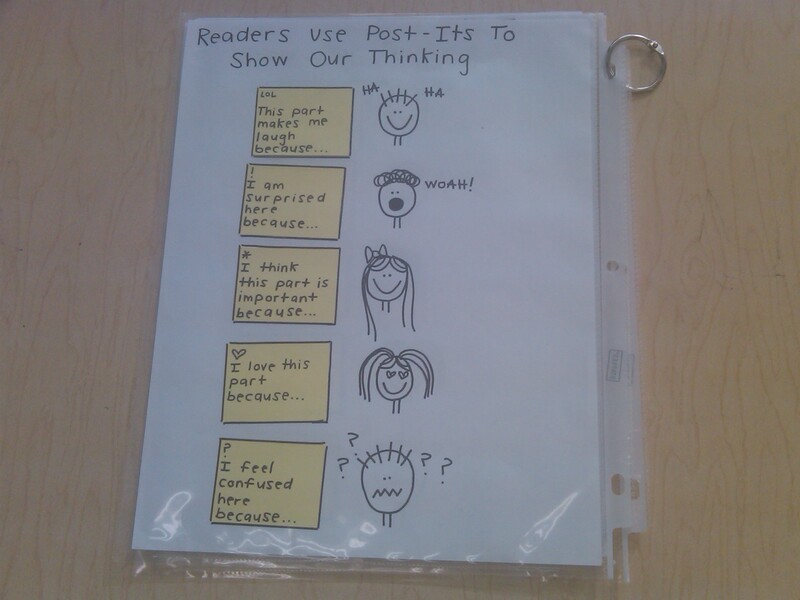 This writing process chart has been hanging in Kristine’s classroom for months, but somewhere along the way it became unused. Kristine was finding books with no words or no pictures. Books with one page done, and books that were just scribbled on. 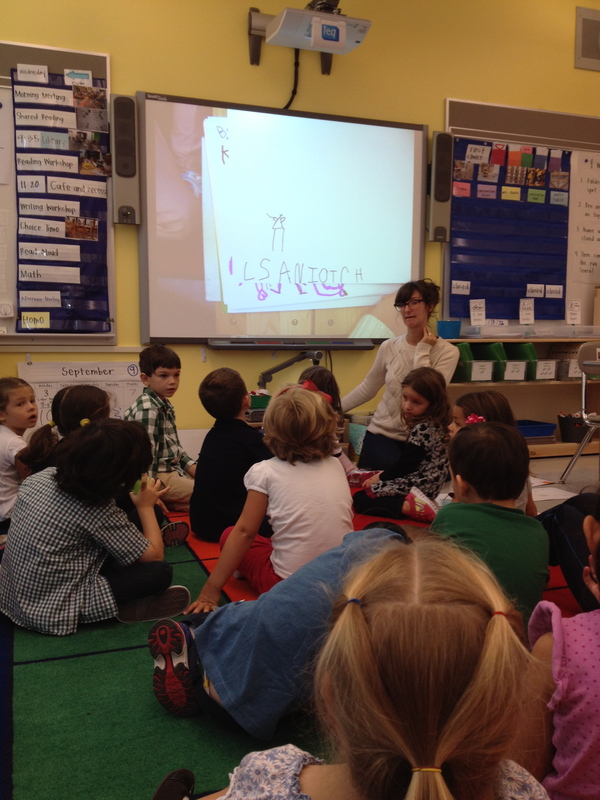 To address this, she decide to revisit the writing process with her class in a more interactive way. Before the lesson, Kristine prepared the matching colored paper and drew the pictures. She left the words off the smaller paper and covered the backs of everything with the restickable glue stick (a favorite tool that turns any ordinary piece of paper into a sticky note). For the lesson, a blank piece of chart paper was hung on the easel and all the pieces placed on the ground in front of her. The class sat in a circle around the rug. Kristine presented this issue: “Last night, when I was reading your “done” books at home with my hot chocolate, I noticed a problem… Friends, not all the books were done!!! Some of them were missing parts! It was so very sad to miss out on parts of your amazing books. 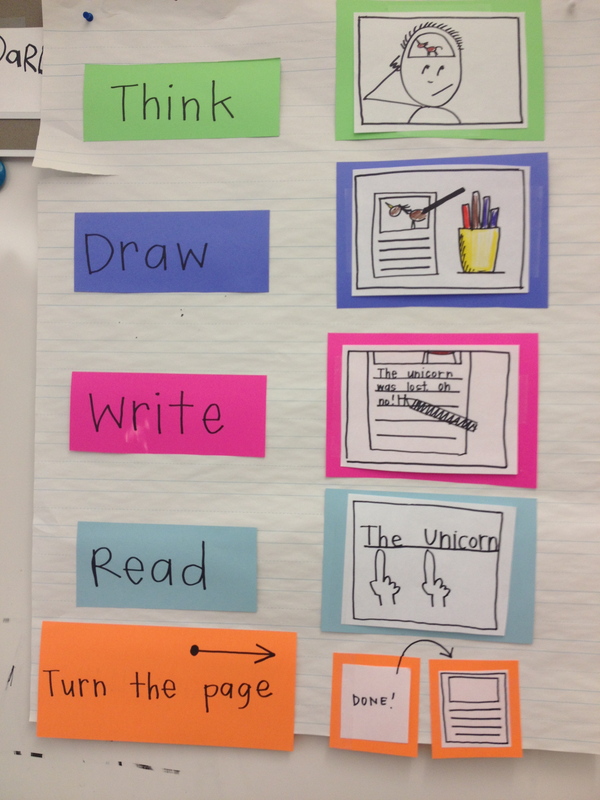 I thought today we could explore all the things we need to do to write a book — and make a new chart for us to follow!” Kristine spread the pictures out so they could all be seen and asked the class, “What do you think we do first?” The students came up to put the pictures on the chart in a sequence that made sense to them. On the first attempt the order was a little scrambled, with turn the page coming very high on the list. Other students suggested revisions to the order until this one was reached and agreed upon by everyone. (Which, by the way, was the order of the original process chart) Kristine then put the smaller pieces of colored paper next to the pictures and asked children to go “knee to knee” and think about what we could call each step. Since children in Kristine’s class are familiar with the language of writing, this went very quickly. 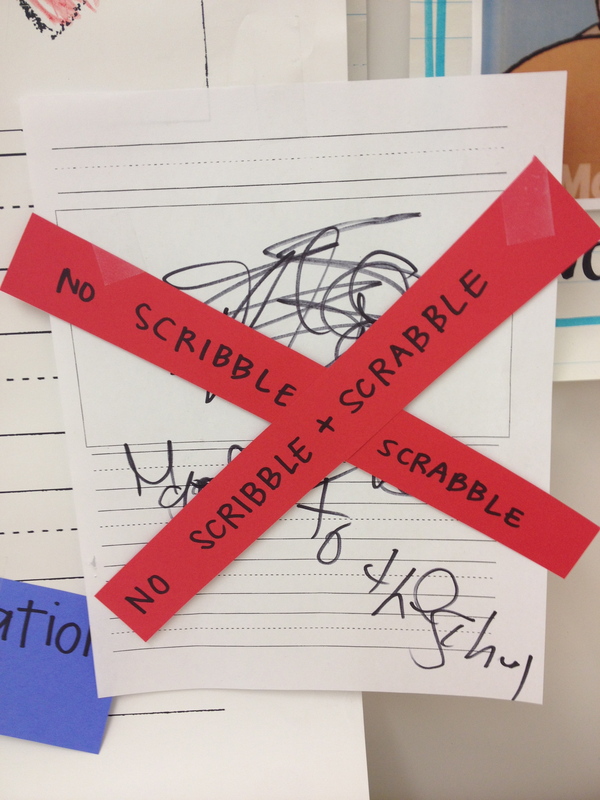 Kristine wrote the label next to each one, everyone reread the chart, and then the children went off to write. 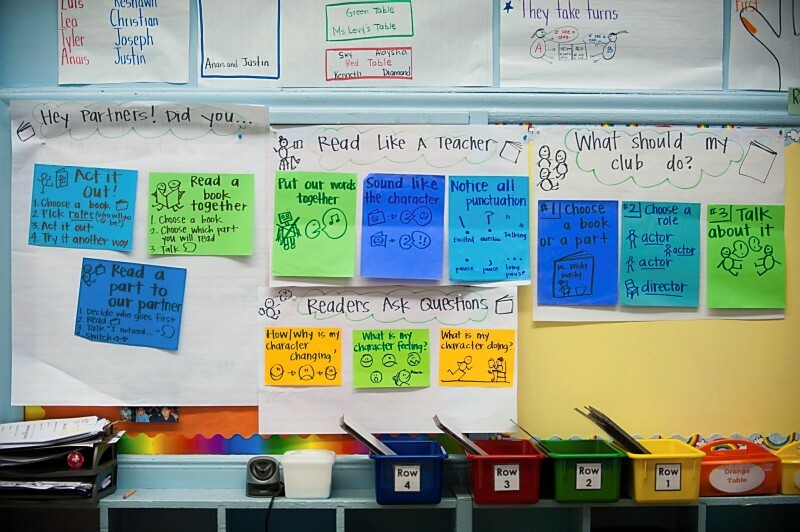 Because of the prep work ahead of time, the entire lesson was 8 minutes — most of that was spent on revising the order of the steps, thinking about what would make sense for writers. And the best part was seeing the children renewed spark and interest in making sure their books used all aspects of the writing process from start to finish. In NYC select students come in for early morning support. 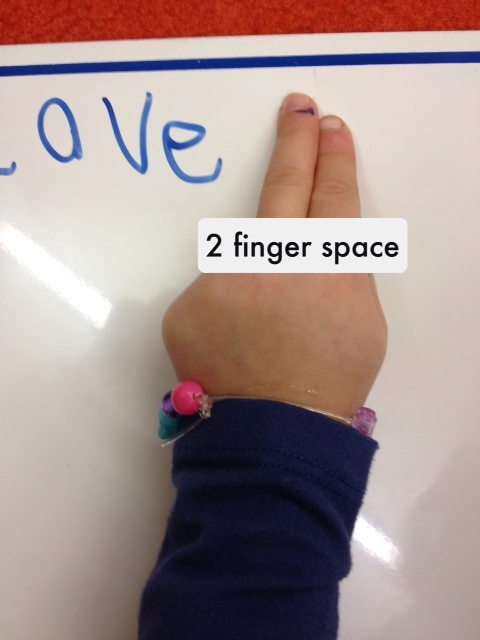 Kristine used this time for interactive writing to support the group with hearing beginning and ending sounds and writing a story across pages. 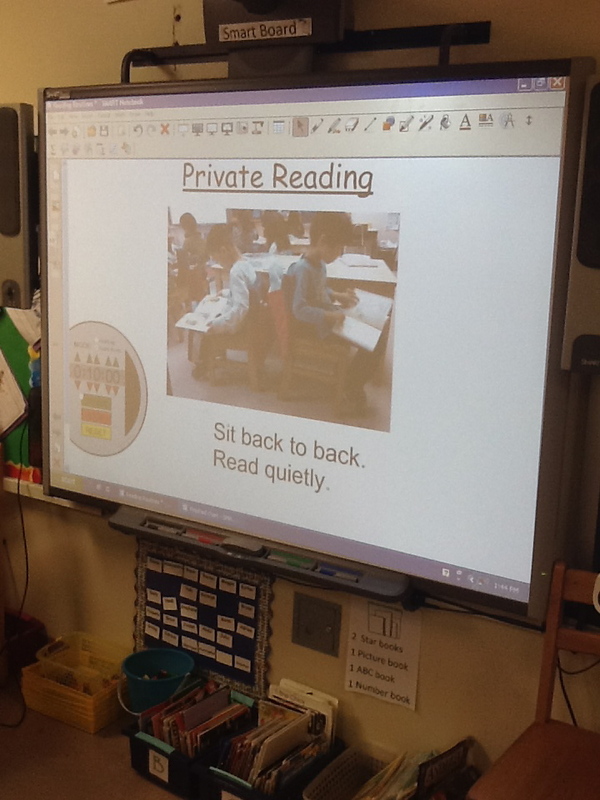 She then took one page from the book that the small group wrote to use in her writing workshop minilesson. Before the lesson, Kristine had the small group work on the interactive writing page, and she also pre-cut colored paper. 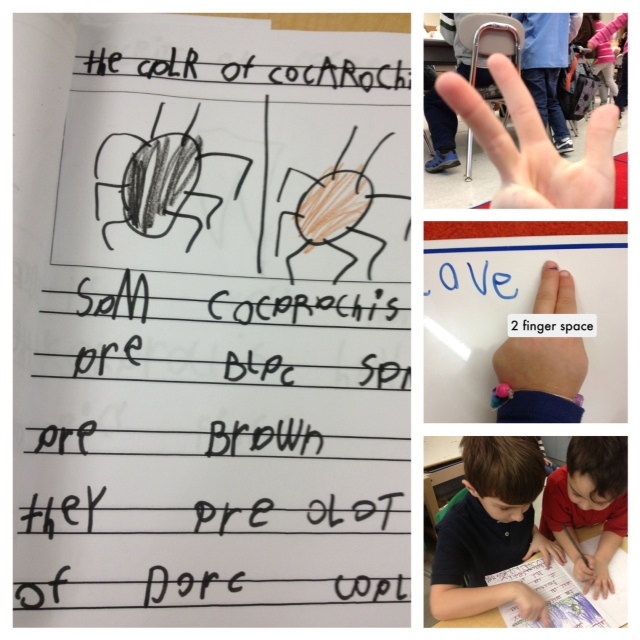 She wrote on some of the papers: spaces and sight words and drew the pictures. The other pieces of cut paper she left blank. The whole lesson, start to finish, was about 8 minutes, thanks to the work that had been done already. Having some items prepped, and then having the children help to co-create the chart kept these charts looking clear and useful, while maintaining their useability for children. Both of these charts are referenced by the children frequently, in part because they are the ones who built them for the class. 2. 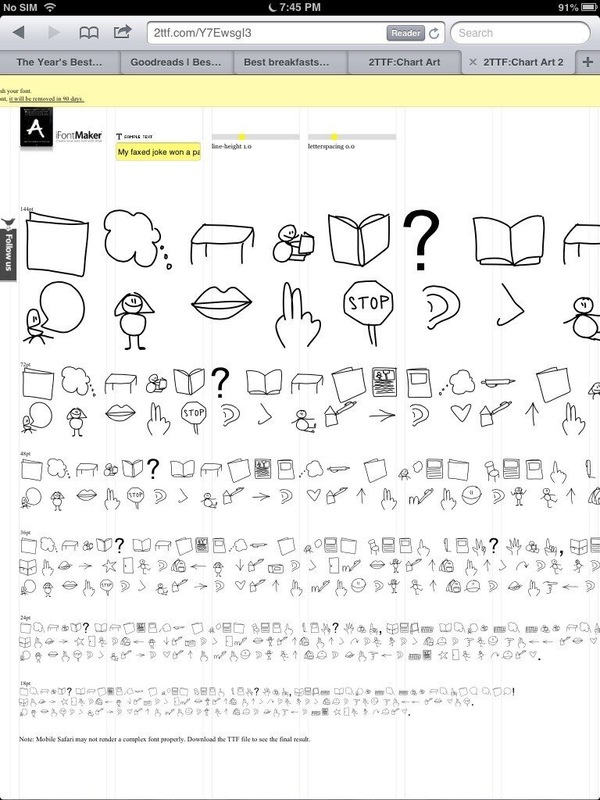 You can make your own wingdings — which Kristine used to draw some frequently used chart icons so when she types up charts, she can just insert the same icons that she would usually hand draw. We are sure you have many more ideas for how this exciting app can be used, and we look forward to hearing about them in the comments.